Jeep Wrangler Unlimited - added Versatility! Auburn Hills, Mich., Jan 06, 2004 -Go-anywhere, do-anything and now bring everything! The icon of the legendary Jeep® brand just got more versatile with 15 inches added to its overall length. The new 2004½ Jeep Wrangler Unlimited delivers 13 inches more cargo area and two inches more second row leg room, while maintaining the unmatched open-air fun and 4x4 capability of the original Jeep Wrangler. The legend grows. While maintaining its legendary 4x4 Jeep capability, the new Jeep Wrangler Unlimited offers more refined, on-road comfort and quietness because of its longer 103-inch wheelbase, which includes an additional 10 inches compared to the original Wrangler. The versatility and functionality is increased with the additional 13 inches in space behind the second row, giving the Wrangler Unlimited double the amount of cargo capacity. The additional two inches in the second row provides more leg and knee room for passengers. Access to the second row is also improved with tip and slide front seats added to the driver’s side. In addition to the more refined ride, the longer wheelbase contributes to the Wrangler Unlimited’s best-in-segment towing capability of 3500 lbs., which is 1500 lbs. more than the standard Wrangler. The Jeep Special Program Engineering team that created the Jeep Wrangler Unlimited was careful to protect the legendary 4x4 capability that Jeep Wrangler owners want and expect. How much was the right amount to lengthen the Jeep Wrangler? Even with the additional wheelbase length and increase in rear overhang, the Wrangler Unlimited was designed to maintain the 20 degree breakover angle minimum guideline for off-road driving. In addition, the Jeep Wrangler Unlimited is also Trail Rated. The 2004.5 Jeep Wrangler Unlimited features as standard equipment the 4.0-liter PowerTech™ I-6 mated to the 42RLE four-speed automatic transmission. The 4.0-liter engine is rated at 190 horsepower (142 kW) at 4,600 rpm and 235 lb.-ft. (319 Nm) of torque at 3,200 rpm. Also standard on the Wrangler Unlimited are a Dana 30 front axle, a rear heavy-duty Dana 44 axle, 30-inch tall R15 Goodyear Wrangler GSA tires, 15-inch Ravine aluminum wheels, high-pressure gas-charged shock absorbers with a 3.73 axle ratio, fog lamps and tow hooks. Jeep Wrangler continues as the only open-air sport-utility vehicle with legendary Jeep 4x4 capability. Staying true to its heritage, the new Wrangler Unlimited adds another option to open-air fun with an innovative new Sunrider™ soft-top, which includes a “sun roof” feature in addition to the full top-down option. This new soft-top gives a second open-air option by folding the soft-top back completely over driver and front passenger to create a 45x23 inch sun roof opening -- larger than any typical glass sun roof. 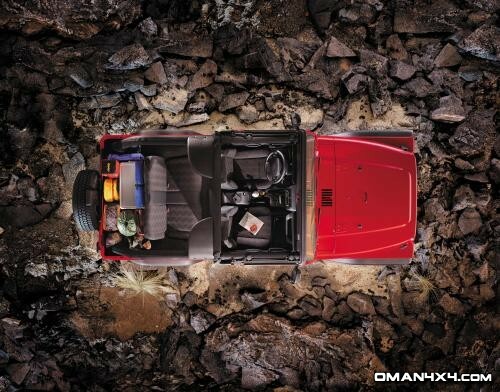 The sun roof can also be operated from the inside of the Wrangler Unlimited, once the vehicle is stopped. The Sunrider™ soft-top includes larger, deep-tinted side windows, giving second row passengers a better view outside. The Wrangler Unlimited is also available with a new hard top with added strength and larger, deep-tinted rear windows, as well as rear defroster and back glass wiper and washer. Standard features on the Jeep Wrangler Unlimited are full-steel doors with deep tinted windows, Sunrider™ soft-top, padded Sport Bar, air conditioning, AM/FM stereo radio with CD, easy access tip and slide front seats, fold and tumble rear seat, front and rear floor mats, next generation air bags and power steering. Optional equipment includes body-side side steps, electrochromic mirror with compass and temperature, engine block heater, hard top, locking fuel cap, Sentry Key, seven speaker package, leather-wrapped steering wheel and speed control. Will we see it in Oman? I for one certainly hope so. Unfortunately Jeep doesn't want to! If you like it, get in touch with Jeep and encourage them to start selling it abroad! I love the Jeep Wrangler as it is, but could certainly use the added space, and I know I'm not the only one! The Wrangler Unlimited is possibly the perfect Jeep for Oman. Open air fun for you and your friends and, at last, it's practical!